Identifying the precise cause of an IT issue can be daunting and takes time. Lacking visibility into your IT environment doesn't help matters either. As IT complexity and interconnections continue to grow, you need an effective management platform that drives higher service levels, streamlines operations, and puts time back on your side. The ShorePatrol Service Assurance Platform is a powerful hybrid SaaS solution that continuously monitors and manages IT environments using patented, appliance-based software that resides securely in your data center. 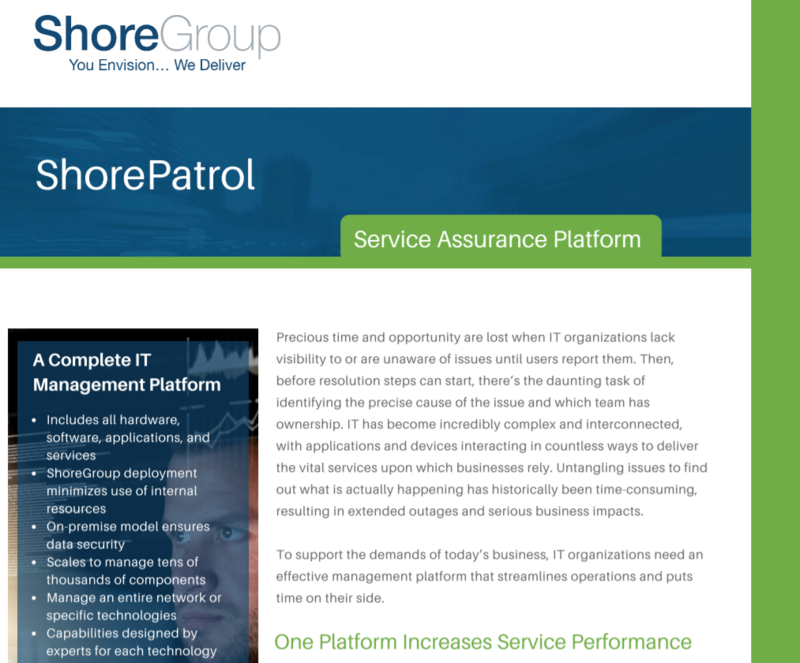 Read the ShorePatrol Service Assurance Platform datasheet to learn more. © 2019 ShoreGroup. All Rights Reserved.